Christopher Reynolds received his MFA at the California Institute of the Arts and his BA in Fine Art at the University of Southern California. Reynolds’ current body of work examines relationships with food. More specifically, he investigates the relationship to ourselves and each other with food as the catalyst. 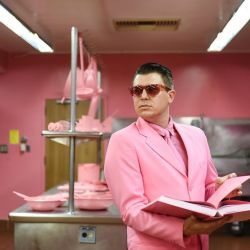 His work includes sculpture, installation, photography, video, and performance to demonstrate who we are through what we eat and how we eat it. As a previous member of the Wilmington-based art collective Slanguage, Reynolds has exhibited at MOCA, LACMA, and LAXART. He was included in The Mexicali Biennial 13 at the Vincent Price Art Museum. He exhibited solo and duo projects at the Skirball Cultural Center and Thank You For Coming.